The great thing about sports is you never know when you are going to see something that you have never seen before. Or in the case of the Cleveland Browns, see something that you wish you could then un-see. Such was the case on Sunday as the Browns found a way to lose to the Jacksonville Jaguars by the score of 32-28. Things started out well as quarterback Brandon Weeden hit Josh Gordon (more on him in a moment) for a 42-yard reception on the Browns first possession of the game. Two plays later, the Browns scored on a one-yard rushing touchdown by Willis McGahee – talk about something we haven’t seen a long time – and things were off to a good start. The Jaguars answered right back, with Chad Henne hitting Chris Harbor with a touchdown pass to tie the game with a little over seven minutes remaining in the first quarter. But then the Browns defense took over. Following that touchdown pass, the Jaguars had seven offensive possessions the rest of the first half and piled up all of 51 yards of offense – but went into the half leading, 20-14. And it was all thanks to Weeden. The Browns took over with 2:47 left in the second quarter with an opportunity add to their 17-7 lead or, worst case, get to halftime still in front. But Weeden’s first pass of the drive was intercepted by Johnathan Cyprien. Three plays later the Jaguars were in the end zone, thanks to an eight-yard pass from Maurice Jones-Drew to Mercedes Lewis. Cleveland got the ball back with 1:19 left and Weeden’s first pass was intercepted by Dwayne Gratz. Four plays later, the Jaguars were on the scoreboard after a Josh Scobee field goal. The Browns got the ball back with 48 seconds left until halftime and Browns fans everywhere praying the team could just make it to halftime. But on a third-and-four Weeden was sacked, fumbled the ball and Jacksonville’s Sen-Derrick Marks returned the ball to the Cleveland 15-yard line. A 36-yard field goal by Scobee closed out the worst second quarter we’ve seen from the Browns since … well a couple of weeks ago against Cincinnati. Browns head coach Rob Chudzinski made the somewhat surprising move of keeping Weeden at quarterback to open the second half and it looked like a good move when Weeden hit Greg Little with a four-yard touchdown pass to help the Browns retake the lead. The defense, obviously tired of dealing with the offense’s mistakes, did its part in the third quarter, holing Jacksonville to just five yards of total offense. It looked like the Browns had righted the ship. But then the fourth quarter rolled around. After trading punts to open the quarter, the Browns took over on their own 14 where, on first down, center Alex Mack shot the snap over Weeden’s head and into the end zone, where Weeden gave it a nice finishing kick out of the back of the end zone for a safety. We really wish we were making these things up people, but it really happened. 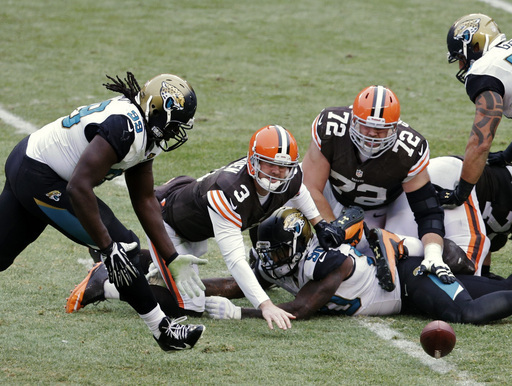 The Jaguars tacked on another Scobee field goal after the ensuing free kick and it looked like the Browns were done, trailing by four with a little more than four minutes left to play. But then Josh Gordon happened. Firing from his own end zone, Weeden hit Gordon down the right sideline and Gordon did the rest, taking the ball 95 yards for the go-ahead touchdown. It was Gordon’s second touchdown reception of the day during a game where he would finish with 261 receiving yards, breaking his own franchise record set just a week ago. Gordon is the first player in NFL history with consecutive games of more than 200 receiving yards, and his 498 yards in the past two games is also an NFL record. He becomes the first Browns player to ever have even a single 200-yard game and surpassed 1,000 yards on the season, the first Cleveland receiver to do that since 2007. At the risk of being struck down by lightening, give Gordon a decent quarterback to work with and he will quickly become the greatest supplemental draft selection in franchise history. This being the Browns, though, the good times could not last. The defense, which really had played well all game, finally allowed the Jaguars to get something going, with the biggest mistake coming from corner back Joe Haden, who bit on a fake and allowed a Cecil Shorts touchdown reception to cap off a nine-play, 75-yard drive by Jacksonville that locked up yet another loss for the Browns. So now what for the Orange and Brown? This was likely the last chance the Browns had to win a game, although the games against Chicago and the Jets are still up in the air thanks to unsettled quarterback play by both teams. The Browns are most likely not turning anything around this season, not with so many problems on the offense. For now, the best course of action over the final four games may be to just enjoy watching Gordon each week and the occasional big play from the defense. Oh, and keep your eyes open. Because you never know when the Browns will show you something you’ve never seen before.